A lot of people don't like the combat in The Witcher 3. I liked it, but then, I hated Gwent. Whenever the game forced me into a match I'd do my best to lose or forfeit immediately, such was my disdain for the in-universe gambling racket. 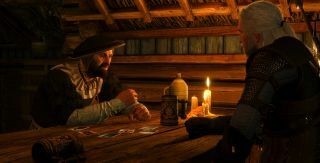 So Hearts of Card, a mod that replaces combat with Gwent matches, doesn't appeal to me at all, but it might very well appeal to you. The video above gives you a rough idea of how it pans out: encounter an enemy and, instead of slaying it with your sword, you beat it at Gwent. It might look like a joke, but it's not. It's a fully downloadable mod that you can download now, and apparently you can play through the whole campaign this way. Sounds like a great way to ruin a good game to me, but if you dig Gwent, have fun with it. That's not the only recent Witcher 3 mod of note: there's also a project aiming to revamp the game's (already quite brilliant) graphics.